MSM and Glucosamine For You and Your Pets! BLM Essential Oil Supplement was specifically designed to support normal bone and joint health. It contains three essential oils, type II collagen and MSM that are known to support healthy cell function and encourage joint health and fluid movement. 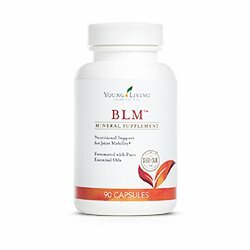 Whether you are preventing joint or bone discomfort due to aging and normal daily activities; or you already are experiencing occasional discomfort BLM Essential Oil Supplement is for you. I love that this supplement contains therapeutic grade essential oils. Wintergreen and clove essential oils are supporting oils. Wintergreen Essential Oil contains 85-99% of methyl salicylate the same active ingredient as birch. BLM Essential Oil Supplement is safe for human and animal use; and is also available in a powder form which is great for your horse. With the powder, I usually place it right in my horses food and they eat it right up! And they get all the health benefits of MSM, glucosamine and essential oils! This is an easy reference guide for BLM Supplement. It will tell you how to use it and what to use it for! Buy BLM Essential Oil Supplement Here! What is in BLM Essential Oil Supplement? Glucosamine sulfate – Derived from shellfish, glucosamine benefits the body by aiding in the formation of cartilage. Rice Bran – Rice bran is a fantastic source of squalene. Manganese Citrate – This is a catalyst which synergizes ingredients; and is a cofactor in the creation of collagen. The essential oils that are contained in BLM are listed below along with a brief description of the oil. Balsam Fir Essential Oil (Abies balsamea) traditionally used for muscular aches, the warm aroma of balsam fir soothes and rejuvenates body and mind. Known for supporting respiratory function. For Capsules: Take one capsule per day or up to three per day if less than 120 lbs. ; up to 4 per day if you weigh between 120 and 200; and up to five per day if you weigh over 200 pounds. This product also is available in a powder form that can be mixed in with food. This may be the best alternative for large animals. The capsules are recommended for cats and dogs. Great if you want to use glucosamine or MSM for dogs. For Powder: Take 1/4 teaspoon per day or up to three times per day if less than 120 lbs. ; use 1/4 teaspoon up to 4 times per day if you weigh between 120 and 200; and up to five times per day if you weigh over 200 pounds. Can this product be used for Animals? Yes, for dogs and horses according to weight guidelines above and here. Place it in their food as needed. Small dogs and cats use up to 1/2 capsule per day. Medium dogs up to one capsule. Large dogs up to 3 per day. The capsules are recommended for small animals because the powder contains xylitol which has been shown to create some issues in high doses in dogs. Want to Purchase BLM Supplement? Then go to the Oil Shop! Buy BLM Supplement Capsules or Powder here. Also check out Sulfurzyme Supplement which combines MSM, FOS and Ningxia wolfberries in a convenient powder form! Or Omega Gize with D3, essential oils and Omega 3 fish oils.